What is Premise Insecticide ? Premise Insecticide is a low toxicity insecticide product developed by Bayer Environmental Sciences that effectively kills insect pests that cause damage to wood and structures. Premise also kills a wide variety of ants including carpenter ants. Premise is odorless, non-staining and easy to apply. Premise has a low environmental impact and is non-repellent to pests. Pests don't even know that they have been exposed to Premise which enables them to transfer Premise to others members of their nest or colony which can result in total colony elimination. Pest Control Professionals across the country have relied on Premise to control carpenter ants and termites. Now you can use Premise to control termites and ants in just about any situation. The active ingredient in Premise is Imidachloprid which offers residual control as part of a season long termite or ant control program. Imidichloprid offers a low hazard around adults, children and pets with no odor. What Pests Does Premise Control ? Premise controls a wide variety of pests including Subterranean termites, Formosan termites, Drywood termites, wood destroying beetles and carpenter ants. Premise is for use in and around Homes, Apartments, Garages, Museums, Public and Private Institutions, Schools, Hotels, Hospitals, Kennels, Stables, Farm Buildings, Trucks, Trailers, Warehouses, Supermarkets, Restaurants, and Food Processing Plants. How Long Does Premise Last ? 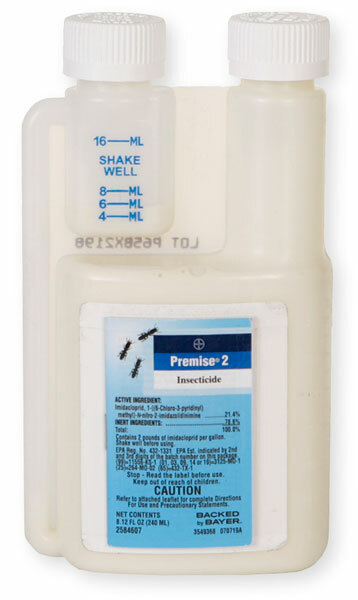 Premise 2 in a 240 ml bottle is a liquid formulation of Premise that easily mixes in water and can be applied to soil, wood, turfgrass, building perimeters and other areas where termites, ants and wood boring beetles hide. Premise 2 is a concentrate and needs to be applied through a handheld or power sprayer. Do not use Premise 2 in a hose end sprayer. (1) 240 ml bottle will make approximately 20 gallons of finished Premise mix or will treat approximately 80 linear feet of trench when treating for subterranean termites. Premise 2 has shown to last 5+ years under normal conditions when used as a trench and treat soil application for termites. Outdoors when used as a spray for ants, Premise 2 has shown to last up to 90 days. Premise 75 is a water soluble powder formulation of Premise that easily mixes in water to form a wettable powder mixture. This wettable powder formulation of Premise 75 enables Premise to better adhere to soil particles and is not easily absorbed by porous surfaces. Premise 75 comes in a 4 sachet pouch. Each sachet makes 25 gallons of finished Premise 75 mix. Premise 75 needs to applied through a power sprayer with agitation to keep the particles in suspension. Premise 75 such not be mixed in a hand sprayer or hose end sprayer. Premise 75 has shown to last 5+ years under normal conditions when used as a trench and treat soil application for termites. 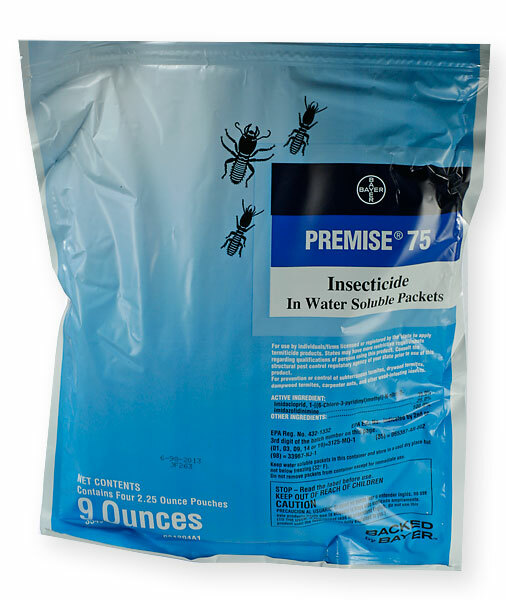 Outdoors when used as a spray for ants, Premise 75 has shown to last up to 90 days. Premise Foam in a can is the latest innovation from Bayer Environmental Science. It's a simple, exciting, unique way to deliver foam that will change the way termites and ants are controlled. Premise Foam is the only non-repellent insecticide available in an instant, portable application. Each 18-ounce can delivers five gallons of foam at an expansion ratio of 30:1, without the need for additional products, mixes or equipment. Premise Foam gives you the flexibility to attack their termite or ant problems immediately. 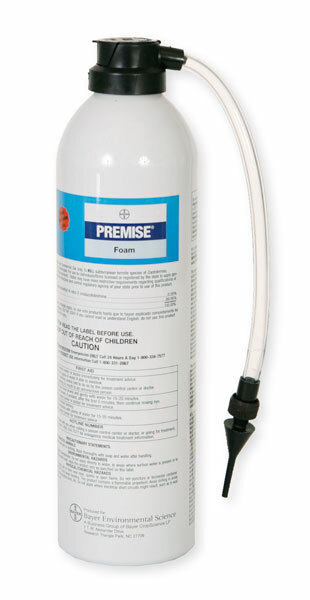 Premise Foam is labeled to control subterranean and drywood termites, ants and other pests. It's ideal for use in termite galleries, wall voids and floor joists. Premise foam has shown to last 3-5 years when applied inside wall voids and other areas away from sunlight and moisture. 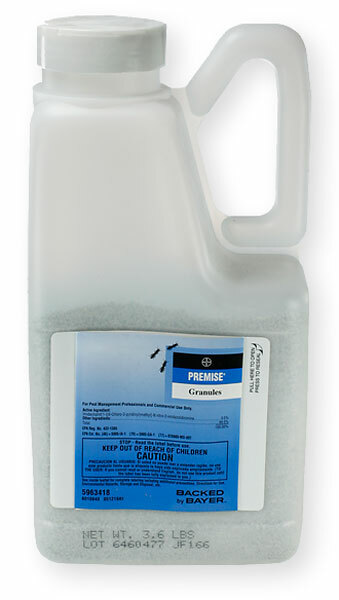 Premise Granules is a new formulation of Premise that enables fast and easy control of termites without the need for heavy application equipment. Premise Granules are the only non-repellent termiticide in granule formulation. No mixing or setup required, Premise Granules can be applied to bare soil without the need for water. Premise Granules give you the flexibility to control termites before a complete structural treatment which reduces termite damages. Premise Granules can be applied to bare soil, landscaped areas, turfgrass and mulch areas. The spot use rate is 3.0 ounces of Premise Granules per foot of trench. 1 container will treat 3-10 linear foot trenches or 1.5 lbs per 1000 square feet. Premise Granules are a spot treatment product only and should not be used a standalone treatment. Premise Granules have shown to last up to 90 days when used as directed. Copyright © 1997 - 2017 ePestSupply - All rights reserved.